The Board of Education election results are official and the battle over its $63 million budget is over for this election cycle. Some of its trustees: new, returning and existing reflected on the election and the circumstances surrounding the challenges, unique to any other in living history. Part of the change had to do with the calendar. A bruising battle over holding November elections saw Hoboken join the vast majority of NJ school boards approving a move to Election Day in the fall last February. The charged differences saw almost the entire City Council minority show up with other of their backers to oppose the move when the decisive 5-4 vote approving the move was held. The battle between Old Guard forces and the reform oriented Kids First majority played out as the first battle in a pre-election 2013 skirmish for Mayor Zimmer's office and three at-large council seats. The BoE election has been viewed as a precursor to the larger citywide municipal election in recent years. With a pitched battle set for 2013, the BoE election became a focus with large stakes for all sides. Then Hurricane Sandy slammed into town and curtailed most election efforts freezing the support as power came back barely in time for the polling stations to set up for the City's voters. "The first two elections I canvassed in April. For this November's election, people were much more receptive. I was appreciative of the increased interest in the School Board election. While intending to vote for the President, many more people participated in making a difference in Hoboken's local elections too." The Hoboken Board of Education's nine member body will see a six vote Kids First coalition come January. Their victory means continuing efforts to put money into the classroom and elevate the entire district. Boe Trustee Commissioner Trustee Peter Biancamano backed the Move Forward slate and offered his view as a current member. "I supported three exceptional candidates in this race, each would be a superb board member. To say I am disappointed in the results is an understatement." He added he was ready to work with all the members of the board for the betterment of the Hoboken school district. The sole returning board member, Ruth McAllister looked at the results with her re-election as vindication for several years of effort. When Kids First became the majority in 2009 it uncovered and addressed numerous audit violations going back over several years. The election was tinged with trepidation a change in the majority would see pre-election bluster against the current superintendent Dr. Mark Toback ousted in favor of a patronage selection. McAllister said in a statement, "Personally speaking, as an incumbent who was running for re-election, this victory is more rewarding then my election in 2009. Re-election means that the public believes I have proven that I deserve to be on the Hoboken Board of Education." Speaking of her fellow running mates McAllister added, "They are going to be great assets to the board." Joe Branco the co-campaign manager for the vanquished Move Forward slate, offered a sanguine perspective saying by phone "Good luck to the newly elected Board trustees. I hope they do a great job for the district and in representing Hoboken as a whole." In the end, it's not clear how much money was spent on the BoE election and based on whispered reports, the true figure may never be known but it may surpass six figures on the Move Forward side alone. Some observers on both sides noted the true costs can't be totaled with the SLAPP launched last August against a dozen Hoboken residents. Close observers on both sides suggest the move to November elections and the timing of the lawsuit was not coincidental and in part designed to level the playing field for the Old Guard, silencing strong voices against corruption and the problems in the BoE's history. That gambit clearly failed along with the now infamous Nazi Truck. 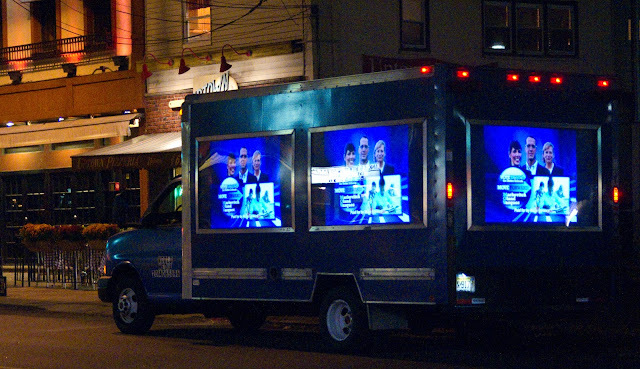 Councilwoman Beth Mason has not addressed the role multiple independent sources say her paid political operatives played in producing the Nazi Truck's five appearances in Hoboken. Both the Nazi Truck and a failed internet strategy against Kids First, Grafix Avenger, MSV and on Hoboken Patch all contributed in leading to an embarrassing defeat. for its candidates exposing the thinly veiled denial of its connection to the campaign. Related: A Grafix Avenger story says Move Forward candidate Liz Markovitch is asking for a recount. A reference to ballots found in the Zimmer-Cammarano race back in 2009 is mentioned but MSV recalls those ballots were legitimate and besides, no change is likely to occur in the BoE race. It's more of an official request to review and check the result. It's a Kids First sweep folks.